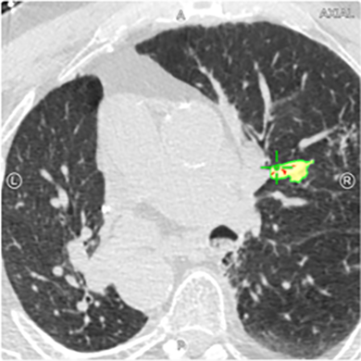 The patient is an 82-year-old male, with a prior history of lung adenocarcinoma, status post left upper lobe lobectomy 20 years ago. 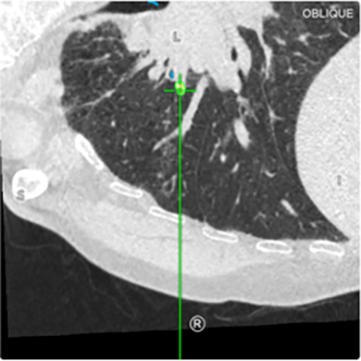 As part of ongoing surveillance, a RUL nodule was seen on CT chest two months prior to the Veran procedure. 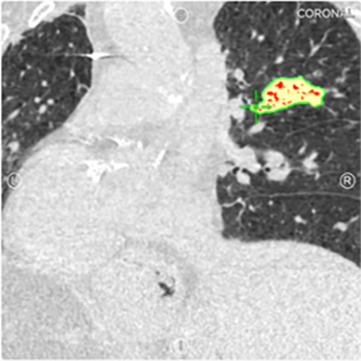 Two months prior to the Veran procedure, the patient underwent a PET CT which showed the RUL mass to be avid. Initial biopsies were pursued in the community, and then referred to our center once initial biopsies were non-diagnostic. Using the SPiN Planning™ software, Dr. Pitts segmented a 44mm target located in the anterior segment of the RUL. Dr. Pitts began the procedure with Linear EBUS and obtained samples from lymph nodes 7 and 11R. Rose called normal lymph cells. 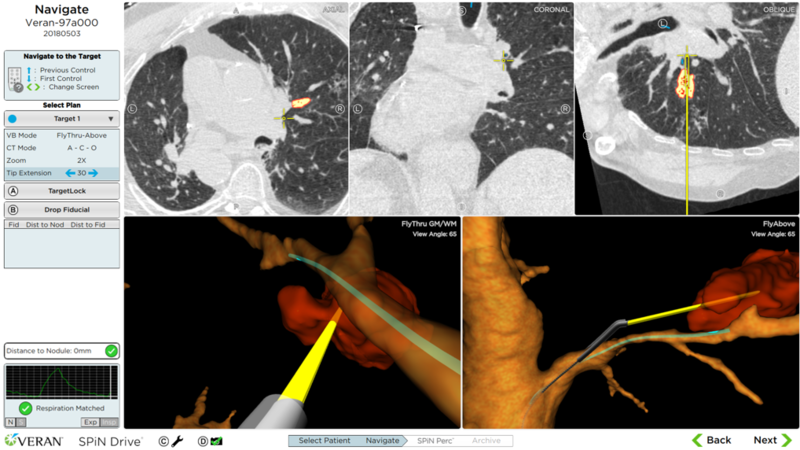 He then transitioned to the SPiN Thoracic Navigation System™ to obtain endobronchial biopsies. Using an Always-On Tip Tracked® 21ga needle that has a 15mm deployment capability, Dr. Pitts was having trouble puncturing through the airway to access the mass. Due to the difficulty of puncturing the airway, he elected to use an Always-On Tip Tracked® SPiN Xtend™ needle with a 40mm deployment capability to puncture through the airway and obtain FNA samples. ROSE called suspicious cells on the first pass. Additionally, three large samples were obtained with the SPiN Xtend™ needle and Always-On Tip Tracked® biopsy forceps.